The few images with GNOME people I made at GUADEC are now online, too. I finally found the time to sort my photos from Vilanova i la Geltrú and Barcelona. Dont miss the the entire album! it while it is hot! There has been some confusion about the date of the Sound BOF, since the BOF Wiki said a different date than my blog story of yesterday. To make this clear: the BOF will happen on friday, 4 p.m.
interested in the future of audio in Gnome is welcome to join us! In related news, the new PulseAudio homepage will be “inaugurated” soon, becoming the official new home of PulseAudio/Polypaudio as soon as we release 0.9.2, which hopefully will be pretty soon. apologize to all the packagers, who need to rename their packages now. 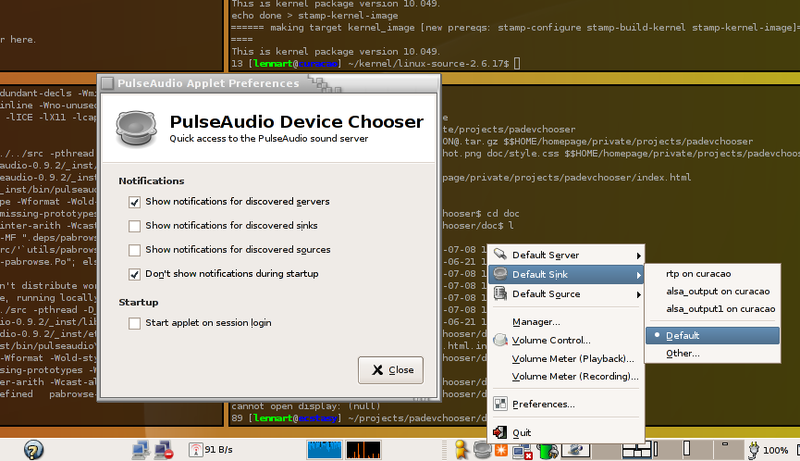 The next release of Polypaudio (0.9.2) will be a bugfix release and be the first to bear the new name: PulseAudio 0.9.2. Polypaudio is dead. Long live PulseAudio! With its support for a wide variety of popular audio utilities, actively developed code, and broad capabilities, the Polypaudio project fills an important role in Linux-based audio development. Please send your suggestions to lennart (at) poettering (dot) net or join #polypaudio on freenode.